Pet proof window screens are now possible using heavy duty fiberglas tough door screen material. This material was originally used as a luggage container fabric but was found to be a really good solution to pets scratching on the patio door screen to get in and get out. The first thing to watch out for is that you wont be able to roll in the old spline you took out of your old patio door screen. 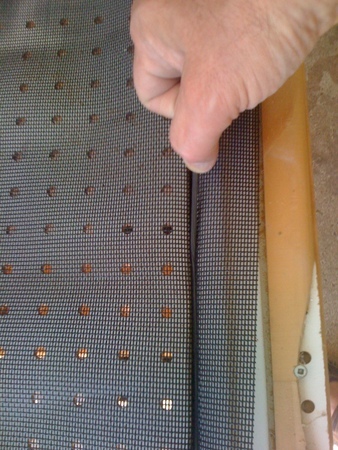 The thick petscreen means you have to use a screen spline a couple of sizes smaller so that you can roll the material into the spline channel properly. 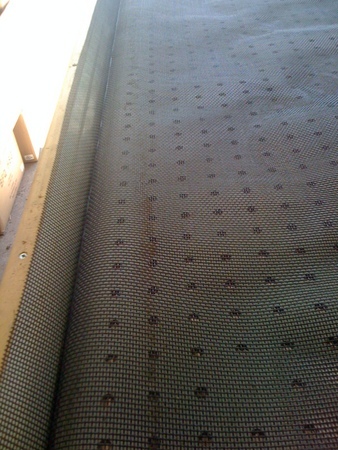 Pet screen is more difficult to roll in than ordinary screen fabric. But if you are careful, pet proof window screens are a good project for a do-it-yourselfer. Just be sure to get the right spline size. 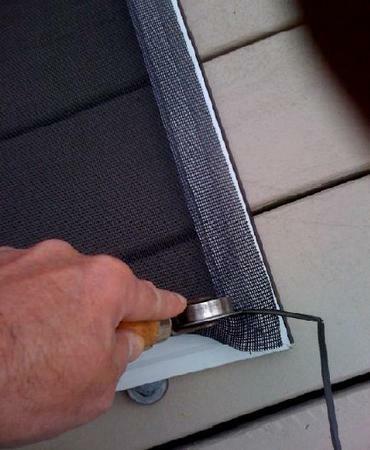 Pet proof window screen is best installed with a screen roller. Poking it into the channel with a screwdriver blade will just be too much of a chore. 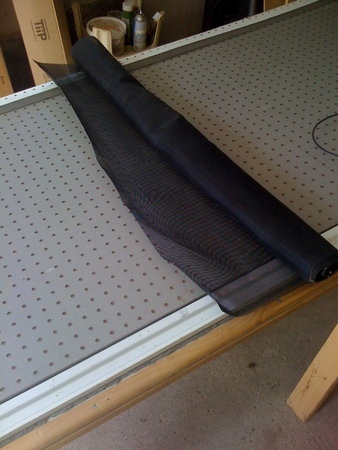 Its best to clamp the screen cloth on all around the frame with lots of spring clamps and then pre-roll one edge into the channel before rolling the spline in. The petscreen is so stiff, it will stay in the channel. Pre-rolling helps get the material square and flat in the frame. You can also pull the material out once or twice incase it does not go in straight. Once you have the material rolled in, you will need a utility knife with a fresh sharp blade. Cut away the excess petscreen being really careful not to cut into the screen you have just rolled in. 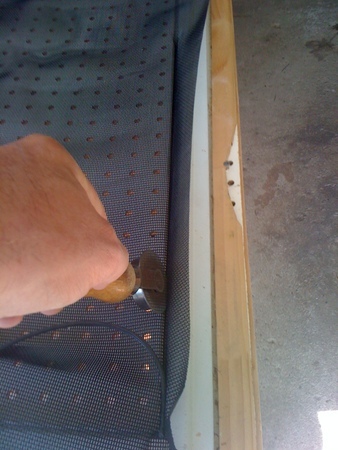 Petscreen is tough to cut so keep a good grip on the knife and go slowly and carefully. Pull out the cutoff material as you go to make sure its cut right through. Working with pet proof window screening is a bit more difficult than regular cloth. The thickness and stiffness of make it a little different to handle. It is also very important to get the size right. You need at least 2 inches wider on both sides. That way you can reposition the material and reuse in case you nick an edge on your first attempt and have to pull out the spline to start again. To begin make sure you have material that is absolutely flat and all the lines in the material run parallel to the frame. One benefit is that it is so thick, if you roll it too tight, You can pull out the spline and start again without damaging the material. Use your flat blade screwdriver to get the spline started in the right hand corner of the frame. Then use a screen roller to "preroll" the petscreen into the spline channel. The material is so stiff it will stay in the channel and you can sight along the length of the bat to see that the material went in perfectly straight. Pre-rolling the material makes sure you do not overstretch it when the spline gets rolled in. After the pre-rolling, start rolling in the spline. You will need to use a spline thats a slightly smaller diameter than the spline you pulled out of the old frame. Petscreen is much thicker than the cloth you had in the frame before. So if you try to use the same spline size as before you will have to push so hard that you will slip with your tools and wreck the new cloth. A trick you can use to make the spline fit is to pull on it as you roll it in. Pulling on the spline reduces its diameter and makes it easier to roll. When you have completed pre-rolling the material in the groove and rolling in the spline,the end result should look like this. The material is rolled nice and straight and consistent. Roll right up to the corner and then use a flat blade screwdriver to push the spline in as you turn the corner. Then repeat the pre-rolling and spline rolling procedure described above. When the time comes to trim the excess material all around the frame, you need a utility knife with fresh sharp blade. 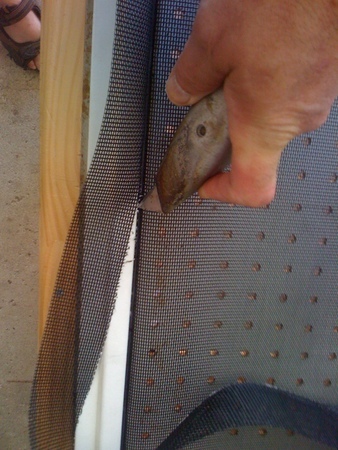 Petscreen requires a little pressure to cut through, if you use a dull blade you are going to slip and scratch the frame or worse, end up cutting yourself. Cut slowly and carefully, dont rush. Cut on the side of the spline furthest from the cloth and keep the blade below the edge of the spline channel for a nice clean cut. You can install various types of "scratch" protectors over top of your slider door or storm door, to guard against pets who claw to get in. The difficulty is, these items only protect one side of the door, and screens dont have clearance on the inside to install one without preventing the door from sliding. Before pet proof window screening came along, I would sometimes install plexiglass in the lower half of a patio door. This works if the screen door can support the added weight of the plexiglass.